Production: Shochiku; black and white, 35mm; running time: 143 minutes. Producer: Nobutaro Shirai; screenplay: Yoshikata Yoda and Matsutaro Kawaguchi, from the original theatrical adaptation by Sanichi Iwaya of an original story by Shofu Muramatsu; photography: Shigeto Miki and Yozo Fuji; editor: Koshi Kawahigashi; art director: Hiroshi Mizutani; music: Senji Ito and Shiro Fukai; choreography: Otowa; costumes: Seizo Yamaguchi and Yoshizaburo Okumura; sound: Ryuichi Shikita and Fumizo Sugimoto. Onoe V ); Yoko Umemura ( Osato ); Tokusaburo Arashi ( Shikan Nakamura ); Kinnosuke Takamatsu ( Matsusuke Onoe ); Benkei Shiganoya ( Genshun Motosuke ); Ryotaro Kawanami ( Dayu Eijyu ). Mesnil, Michel, Mizoguchi Kenji , Paris, 1965. Serceau, Daniel, Mizoguchi: De la revolte aux songes , Paris, 1983. McDonald, Keiko, Mizoguchi , Boston, 1984. Kirihara, Donald, Patterns of Time: Mizoguchi and the 1930s , Madison, Wisconsin, 1992. O'Grady, Gerald, editor, Mizoguchi the Master , Ontario, 1996. Tomasi, Dario, Kenji Mizoguchi , Milan, 1998. Pym, J., Monthly Film Bulletin (London), April 1981. Mellen, Joan, "Japanese Film's 'Truest Creator,"' in The New York Times , vol. 130, section 2, D23, 17 May 1981. Tessier, M., "Contes des chrysanthemes," in Image et Son (Paris), June 1981. Cuel, F., Cinematographe (Paris), July 1981. Bergala, A., "Japon, tour, decor," in Cahiers du Cinema (Paris), September 1981. Carbonnier, A., Cinema (Paris), September 1981. Legrand, G., "Lumiere, rituel, l'amour," in Positif (Paris), February 1982. Bullot, E., "La gifle et le sanglot," in Vertigo (Paris), no. 14, 1996. Burdeau, Emmanuel, and others, "Mizoguchi Encore," in Cahiers du Cinéma (Paris), no. 504, July-August 1996. Lopate, Philip, "A Master Who Could Create Poems for the Eye," in The New York Times , 15 September 1996. 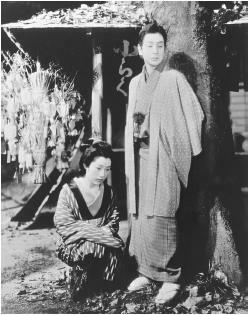 Although Zangiku monogatari is one of the greatest achievements of its director Mizoguchi Kenji (to follow the Japanese custom of placing family name first) non-Japanese audiences, and even many contemporary Japanese, may be puzzled and alienated by its very title, let alone by its theme of the triumph of family duty over personal love and its loving recreations of a vanished period in Japanese history and a decreasingly popular traditional art form. (The film is rendered even less accessible by the fact that many prints of it are defective or incomplete.) Yet making the intellectual and emotional effort to understand and enjoy it is rewarding, for what seems at first to be a stiff and formal drama is really a subtle and unforgettable exercise in subverting traditional values. Zangiku may be variously translated as "late/last/remaining chrysanthemum(s)"; monogatari means "tale" or "story." Onoe Kikunosuke, whose personal name contains the word for "chrysanthemum" and whose family mon (badge) is that flower, is the adopted son of a Kabuki star. He is first seen on stage—in Tokyo in 1885—giving what aficionados would see was a bad performance; he prefers not to study his parts, until the maid Otoku tells him to. She is fired by his mother, but Kiku announces his wish to marry her and leaves home when his father, who now has a natural son to succeed him anyway, refuses to permit their union. The lovers reunite in Osaka, where Kiku has joined a relative's theatre company. They then travel with yet another group until 1890, when it falls apart and Otoku visits Nagoya to plead with Kiku's father, who is performing there. Kiku is invited back into the family but Otoku agrees to stay away (without his knowledge). Many years later, when the family theatre group is performing in Osaka, Kiku is permitted to visit Otoku there, finding her on her deathbed. The film closes with her death and his appearance in a parade on the Yodo river, scenes which are intercut to maximise the contrast between her failure and isolation and his success and acceptance. Summarised in this way Zangiku monogatari may seem to be a fairly routine melodrama, in which issues are raised in order to be neatly resolved. Perhaps the stage play from which it was derived fitted such a description. If so, Mizoguchi transforms it, using all the cinematic resources at his disposal in the endeavour to bring the story to life, to make Kiku, Otoku, and the others plausible as human beings rather than symbols or puppets—and to insert his own characteristically understated but powerful sense of the fragility and ambiguity of human feelings into the narrative. The principal technical means that Mizoguchi uses to intensify the varying moods of the film is to shoot the "real" scenes and the three Kabuki excerpts in contrasting ways. The former are shot in long takes, with speakers' faces often in shadow or turned away while the camera pans and tracks to show different perspectives and the presence of third parties, as when Kiku's father remains in the room (offscreen) as a silent but intimidating witness to a discussion of Otoku between Kiku and his mother. The latter are presented in short takes that concentrate on Kiku to the exclusion of other actors and also disregard the convention of filming stage action as if from a realistic audience perspective. The cumulative effect of this contrast is to emphasise the artificiality of the stage performance, its distance from the confusions and complications of real life, and therefore to heighten the illusion that we are overhearing conversations among real people, about real concerns, in the offstage scenes. These real concerns, as in several other films directed by Mizoguchi, include the question of the position of women in society. Although Zangiku monogatari is unusual among his films for having a male central character, its dramatic and moral weight is actually placed upon the fate of Otoku. In doing so Mizoguchi indicates a respect for the audience's ability to work things out for themselves, implicit in the distinctive camera technique described above. Unlike conventional melodramas, Zangiku monogatari never forces a single ethical message on its viewers. Because it seemed to endorse the subordination of women proclaimed by the official ideology of the Japanese government of the day, the film received a prize from the Ministry of Education in 1940. Yet the film also contains, in Otoku's character, a portrait of a strong and independent woman making her own choices; in Kiku's, a depiction of good intentions stifled and diverted by family pressure; and, in their respective fates, an implicit protest against the distorting effects of systematic subordination on women and men alike. Aside from its story, its initially unfamiliar but eventually impressive visual style, and its ambiguous and thought-provoking moral concerns, Zangiku monogatari offers other pleasures, which grow with each year that passes since its initial release, and with Japan's steady development away from the society that it represents and now commemorates. Otoku and Kiku's first long conversation is punctuated by the traditional cries of street vendors, few of whom remain in contemporary Japan; the details of the family home and the attic room in which Otoku dies are as evocative as (say) shots of prewar New York, London or Berlin can be for anyone who knows those cities today; and such scenes as the Kabuki excerpts and the closing procession have become valuable records of a rich cultural tradition. In thus functioning on several levels at once—as an absorbing drama, a classic demonstration of film technique, a provocation to serious thought and complex feeling, and a record of a receding past— Zangiku monogatari transcends its origins as a filmed play, and its status as a specifically Japanese film, to stand as a classic of world cinema.